Homes and businesses are always looking for something hot and new. Epoxy flooring is rapidly becoming a trend and people are taking advantage of its success in the flooring industry. Epoxy is considered as one of the best options for coating your garage floor. With so many other options like floor paints, mats, tiles, concrete, and protectors, what makes epoxy the number one choice for homes and businesses around the world? Epoxy flooring is tough, durable, and resistant to scratches and chemicals. But it is also easy to apply and can give your garage a professional showroom-like look. It is easy to install, takes a few hours to apply and about a couple days to dry. But its strength and low maintenance make it rock for years. Epoxy is not paint. It is made up of a resin and a hardener, that when mixed together, forms a super strong plastic material that resists abrasions and chemicals and bonds amazingly to its substrate. It can stand up to a lot of abuse and is a favorite choice for industrial infrastructures. So what makes it the most successful amongst garage floor materials? Cost – epoxy is cheap and installation is a breeze. Some DIY people do it themselves. Professional installation is more or less $3 to $4 / sq. foot. And the best part is, it is also cheap to maintain. So you avoid long-term expenses due to frequent maintenance. Maintenance – an epoxy floor is smooth and seamless. Its coating is moisture and stain- resistant. It is very easy to clean as dust and other particles don’t stick to it very much. Just mop it with mild soap and water. Toughness and Longevity – Epoxy toughness has been time-tested. It’s no secret that it is one of the most durable materials used for garage floors. The only other material that can match epoxy in toughness is concrete. But concrete requires resealing to maintain its looks and extend its lifespan. What makes it perfect for the garage is that it is resistant to gasoline, oil, transmission fluid, coolant and other chemicals and engine fluids. Heat from the engine or tires doesn’t damage epoxy, as well as water and cold. It is resistant to chips and cracking, as compared to improperly maintained pavers and concrete. 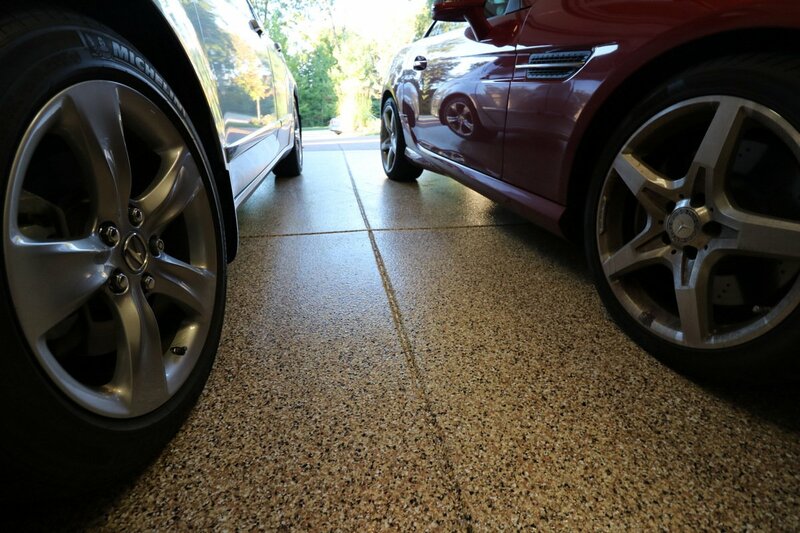 Protectant – coating your garage flooring with epoxy is a good way of protecting the concrete layer from cracks, bacteria, and stains and thus preventing very costly repairs to the underlying surface. Professional look – This is what transforms your garage impressions from “Yeah, it’s a garage.” to “Wow! What a garage.” It can readily hide imperfections in the surface beneath it. It’s is very reflective and makes your garage brighter. You have a lot of colors and design options to choose from. You can choose from metallic epoxy flooring, traditional patterns or personalized designs. The results are always bright and professional-looking. Epoxy floors, however, can be slippery when wet. So make sure you apply slip-resistant coating and aggregates to its top coat. Also, as tough as epoxy is, it is not immune to welding damage, as it can sustain burn marks from the hot welding stuff. Because of epoxy’s initial installation cost, low maintenance leading to good dollar savings in the long run, unmatched longevity, and versatile professional-looking designs, it is clear what makes it stand out amongst other garage flooring coating materials. It gives you the best returns for the dollar. It’s definitely an investment for your home. So if you’re into a project of transforming your garage into a multifunctional one or just caring for it, epoxy is perfect for you. It’s time-tested and it’s beautiful.